The path from heaven to hell will start with one device. The detonation of the first dry fuel ( Hydrogen Hydride) H- bomb in the Bikini Atoll on March 1st 1954 in an experiment code name Castle Bravo. This was one of the first of the Teller–Ulam design. Made later into a much more insidious weapon covered in The Doomsday Machine. What is It? If you can imagine that. This was America’s first operational fusion bomb because it did not need a huge cooling facility to keep the liquid hydrogen packed into the bomb in a cryogenic state as was the case with earlier prototypes that were the size of a warehouse. This was made possible by a hydride composed of lithium deuteride and hydrogen stored in a tank inside the bomb. It would only produce a fusion reaction in the presence of a fission reaction to meld the hydrogen atoms together present in the hydride. The A-bomb was a trigger for the H-bomb. Allowing a H-bomb to be scaled up with more hydrogen hydride would result in a bigger explosion. The Castle Bravo experiments underestimated the potential for lithium deuteride to store hydrogen in a tank resulting in an explosion that almost killed the scientists conducting it and contaminated wide swaths of the Pacific. Resulting in the biggest explosion ever conducted by the United States. Leading to the conclusion that the H-bomb could be made to any scale. Along with this prospect was that mankind could store almost infinite quantities of energy in the form of hydrogen hydrides. The perfect battery! This could power hydrogen fuel cells providing the worlds energy needs forever. The device was called Shrimp and had the same basic configuration (radiation implosion) as the Ivy Mike wet-device, except with a different type of fusion fuel. Shrimp used lithium deuteride, LiD, which is solid at room temperature; Ivy Mike used cryogenic liquid deuterium, LD, which required elaborate cooling equipment. Castle Bravo was the first test by the United States of a practical deliverable fusion bomb (hydrogen bomb). Lithium Deuteride is a benign substance that cannot create a fusion reaction by itself in the absence of hydrogen and a fission reaction to ignite it. It is only a means to more efficiently store hydrogen in tanks and is not radioactive. In fact it’s production is heavily regulated by the Food and Drug Administration and it’s not for sale to the civilian market. Not exactly the men in black! This is packed into the tank allowing hydrogen atoms more places to hide in the molecular structure of the hydride. The lattice like structure of lithium deuteride allows more hydrogen to be pumped into the tank at higher and higher pressures resulting in an ice type substance called hydride. Hydrogen in this state is very stable as this is the most efficient way to store it. Hydride in a tank is the ultimate battery because of it’s huge capacity and the fact that it can be drained almost completely and recharged thousands of times without damage. Needing only a small DC heater to extract some of the hydrogen for use in fuel cells. If one were to think this is just an impossible theory keep in mind the first fuel cells were invented in 1838. This technology or some form of it has been used for years in the space program. The Apollo program, the Space Shuttle, International Space Station and many other space vehicles have used Hydrogen/Oxygen Fuel Cells. The fuel cells are made by a company called United Technologies using cryogenic hydride storage tanks employing this technology made by Ball Aerospace or Beech Aerospace, as they are now called, without fail for decades. These fuel cells weigh about 25lbs and can produce up to 12 kilowatts of energy, providing heat and drinking water to their crews. Do you know of any generator or battery that weighs 25 lbs , can deliver 12000 watts of power and provide drinking water? Enough energy for your average home. Sounds sustainable to me. Wow, don’t you wish you could have this old technology catalyzed by a couple of solar panels and a little water that could power your home? You can’t use it because it is considered a disruptive technology covered by national security and can only be used in hydrogen bombs and space missions. Even though the original formula is not even used in modern H-bombs. If you ask engineers in the sustainable energy industry about the problem of creating enough sustainable clean energy from solar panels, wind turbines, and hydroelectric.They will tell you the problem is not deploying these systems. Enough energy from the sun hits the earth in the form of light and heat in one day to drive all of mankind’s activities for years. The main problem is storage of that energy for use later on. We need a new form of battery. The potential for commercial use of lithium deuteride or it’s derivatives in hydrogen hydride storage could change all of this. Hydrogen is difficult to store in gas or liquid form requiring huge tanks or enormous cooling facilities. In hydride form the tanks are small enough to fit in a spacecraft, vehicle or your home. Imagine a world where individuals could store massive quantities of energy from solar or wind for future use safely. It is the problem man has been working on since the invention of batteries. Sad that corporations and governments of the world keep the population in a sense of suspended animation when it comes to technology. What happened to the stalled Hydrogen Revolution colleges have been talking about for the last 40 years? There was no way to store enough hydrogen safely because of government secrecy. Some companies are testing hydrogen fuel cells for homes or vehicles but most still depend on natural gas not renewable energies and water. Keeping you in the loop. Batteries in use today are basically the same as 100 years ago. Edison sold an electric car with the same range as todays vehicles in 1904, when the batteries wore out you could rinse them out with water and baking soda, refill with solution and you were on your way. Current and past battery technology also horribly inefficient, able to use only half its capacity before being damaged. Deep cycle batteries are able to do little better but you get the point. Here the distinction between home power production(solar panels on your roof) and centralized power production, meant for the grid, must be made. Storing electric for home use is inefficient(without hydrogen hydrides and fuel cells) but storing it from central production is impossible. The only exception are hydro electric facilities that can pump water up hill and use its potential kinetic energy later, a technique in use since the Romans. This is the best our modern technology has to offer? Getting around this in the form of solar arrays and wind farms dumping their power directly on to the grid only compounds the problem twofold. First the DC electric must be turned to AC to be put on the grid, losing efficiency in the inversion process. Secondly all of the coal and nuclear power plants must power up and down to fill demand when the wind doesn’t blow and the sun doesn’t shine. Doing this costs huge amount of energy to be wasted. Everyone knows speeding up to a stop sign is not the best way to save gas. Huge amounts of energy are needed to constantly fire up and down these facilities. If households where able to store the energy efficiently for future use and then contribute to the grid when needed it would solve this problem. If the energy storage problem could be solved, as it already has been for the last half century, there would be no need to have centralized power systems. Existing sources of energy like solar and wind could be used much more efficiently to catalyze hydrogen from water and store that energy. One household could store enough power to exist from last years sunshine or wind, stored in the form of hydrogen hydrides, in a totally safe manner. All this without any need for a new huge infrastructure. Existing facilities such as wind, solar, clean coal and nuclear could all store power this way and transmit that energy over the power lines standing now. Households could have units smaller than a frig powered by water and solar panels on the roof that could run your home and an existing electric car. 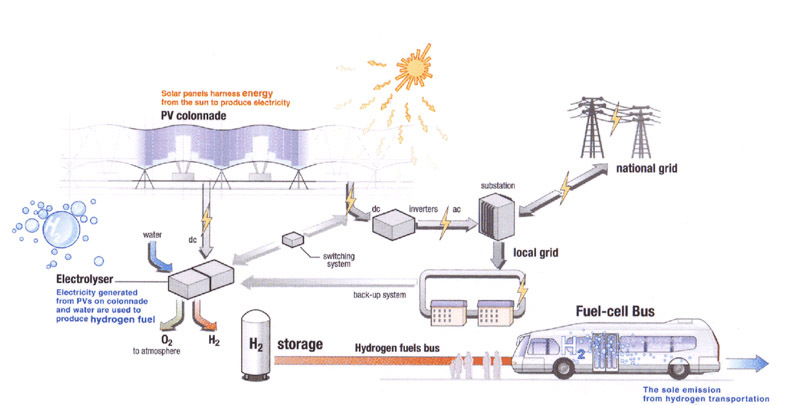 All current infrastructure would benefit greatly from hydrogen hydride battery storage. Catalyzing water into hydrogen would result in energy independence for everyone. This energy could be stored almost indefinitely using small hydride tanks. It has worked safely for years in space. So why aren’t we using this technology? If you cared enough to read this entire article then I think you already know the answer to that. Ford, although a strangely contradictory character in world history as any US WWII serviceman will tell you if he ever looked under the hood of any of hitlers armored vehicles will tell you, his earliest models were originally designed to run on hemp oil. Nope, that kind of stuff was renegotiated and redesigned to support the burgeoning crude oil beast broiling among the robber barons of the industrial revolution. Of course, Tesla, a name now subliminally reduced to a mere brand of automobile, the original master of electricity, tried to give to the world the Tesla Coil that would have given the world free, wireless, unlimited, free electricity. That is, until, double agent and nazi infiltrators GW Bush (Scherff) and hitlers right hand man Otto Skorzeny murdered the penniless Tesla at the same NYC hotel John Lennon died at decades later. Others, independent inventors, like those that have invented plastic containers strong enough to compress AIR tight enough to push cylinders that would power an entire car have been bought out and buried in the past. These technologies have been suppressed for one reason only, profit, accompanied by greed and some maniacal urge to rule over others. One day this tyranny will end. Great material Raptormanteports, great food for thought and inspiring for the next generation that dare to change things. Very interesting report exposes suppression clean energy technology that has been around for decades. Nice article – I had not heard of hydrogen hydride storage before.